I just ate a little bowl of ambrosia while I was sitting in a steamy hot bath. It was decadent. Between Halloween and Christmas, my husband and I took part in the dessert slide of doom. You may know what I’m talking about—a slippery slope from dessert as an occasional treat to dessert nearly every day to dessert every day to dessert plus a little piece of something sweet earlier every day. At that point, eating sweet things, craving sweet things, is reflexive, not even very enjoyable. (It’s easy to do if you’re baking a lot for the holidays—a cookie here, a pinch of cake there. . . .) Ouch—it’s not healthy to be eating all that sugar, fat, and processed flour. By last weekend, when we unpacked our scale, I’d gained three pounds, which was a sign it was time to nip it in the bud and get back to healthier eating. Since we were eating at home for New Year’s Eve before going to the symphony, I wanted to make a special fruit-based dessert for us to have with our celebratory meal. I settled on developing a truly heavenly version of ambrosia—if it’s going to be called the food of the gods, it better be something special. When I put a bite of marshmallow and nut with whipped coconut cream in my mouth today, I closed my eyes and thought, “It tastes like a sweet little cloud”—a great foil for the sourness in the citrus fruit. Note: You have to refrigerate your can of coconut cream for at least six hours, so make sure you do that in advance. Put a metal mixing bowl and your beaters in the freezer to chill for at least 20 minutes. Prep the fruit and marshmallows. Combine the fruit, nuts, marshmallows, and grated coconut in a large bowl, and place the bowl in the refrigerator. Remove your mixer pieces from the freezer, and put your mixer together. Open one can of coconut milk. Scoop out the thick layer of coconut cream that’s formed in the top half of the jar, and put it in your mixer. (Discard the remaining coconut water, or reserve it for another use.) Add sugar to the mixer, if using. Whip at high speed until the cream is light and fluffy—if your mixer is cold and your cream is cold, you should be able to form soft peaks. Add the coconut milk yogurt, and whip for 15 seconds more. Gently fold the whipped coconut cream mixture into the bowl of fruit. Refrigerate two or more hours before serving. 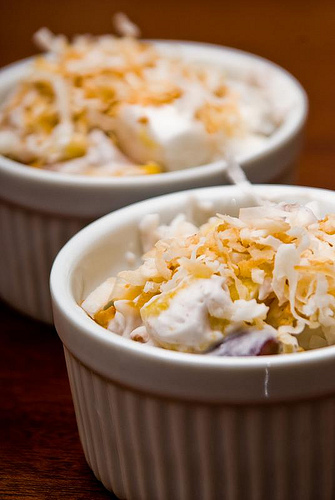 If desired: to top the dessert in individual bowls, toast 1/2 c. shredded coconut in a skillet on medium-low heat until most of it has turned light brown. Sprinkle a tablespoon of toasted coconut on each serving. This sounds delicious. I love fruit for dessert. Question: Where do you get vegan marshmallows? And Comment: I understand that fresh is usually better, but “fresh” pineapple is not easy to come by here in northern Maine in January! Oh, and I understand that fresh pineapple is a splurge or can be hard to find, but I think canned pineapple pales so far in comparison that it’s not worth eating. Frozen, maybe? I had never “gotten” the concept of Ambrosia until I saw your picture and read the recipe. I have to have this!!! I have never had Ambrosia, but just reading through the recipe made me extremely hungry! Sounds awesome. I inadvertently made something similar today. Kinda…sorta. Maybe not nearly as exciting. There is no need to buy marshmallows when you can make your own fabulous vegan marshmallows at home. The breakthough ingredient to making vegan marshmallows is you need a fluffy mixture into which you beat the jell mixture. Soy protein isolate is what the commercial vegan marshmallow makers use for the fluffy stuff. Great idea . . . for those people who can tolerate soy. I couldn’t eat the marshmallows with the soy protein isolate. Other than make it yourself, is there a brand of vegan, soy-free marshmallows. As a commenter pointed out above Sara and Sweet is vegan, but not soy-free.